Time to start filling up the input drum with parts. First, we’ll start gathering some parts for cleaning. The rebuild kit provides a new underdrive return spring retainer (not pictured). And just look how dirty that underdrive piston was! I made things a little hard on myself by not pressing the input shaft out of the hub. But I managed to make it work. These rings are “scarf cut”, which lets me open them up and slide them into place. I used some dull dental-style picks to carefully work them into their grooves without damaging them. 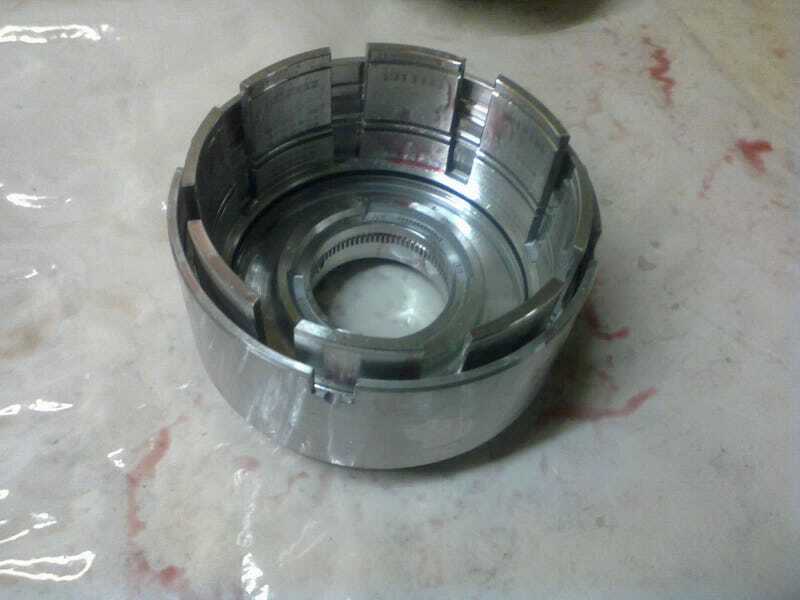 This spring gets pressed back down onto the OD/R piston and held in place by the snap-ring. ...so I use this homemade “Lip Wizard” to slide around between the pistons to help keep the rubber lip seal from getting caught on the edge of the UD piston. The trick here is to center everything in the compressor so that as the spring compresses, the retainer bulls-eyes the UD piston.